In this serving bowl the glaze pattern is reminiscent of a spring meadow with pink flowers peeking through greening grass and ice white snow melt. The rim is both fluted and stamped with a flower pattern in rose pink. 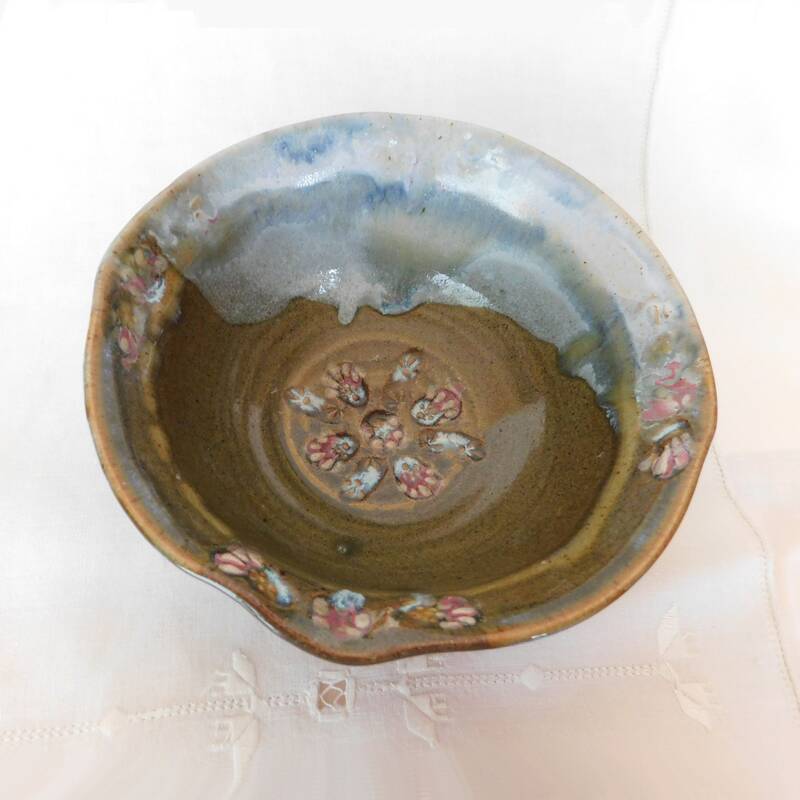 The bowl was made with glazes that have since been discontinued. Matching the glazes is not possible. 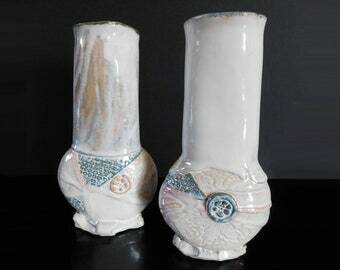 However, pieces may be ordered in glazes that will work with it. It measures about 3 1/2"from foot to rim and 8" in diameter. All PorcelainJazz orders are soft gift wrapped over their bubble wrap. If you would like the added crispness of a boxed gift please use gift wrapping. The ring dishes are perfect and beautiful. This company bends over backwards to make sure your order is perfect. High quality workmanship with excellent customer service. Will order again! We are set up to accept PayPal or Etsy's direct checkout using a credit card. We also accept Etsy gift cards. A return shipment should be returned packed in the same manner and, if possible, packing material that it arrived in. Please remember that your refund for broken pieces comes out of the proceeds from insurance. The exception to this policy is items under $20 and less than 13 oz. These items are self insured by Porcelain Jazz. Please contact us immediately if you have a problem with anything we have shipped you. We cannot accept returns after two months. If you find it necessary to return a piece we would appreciate an explanation as to what was wrong with it. We are very sorry but we cannot refund shipping either way. We will refund the actual cost of the piece once the piece is in our possession again. If breakage occurs we will reimburse you out of the proceeds of the insurance. If you cancel an order before shipment a full refund of both shipping and price will be given. If you are returning an item which ships for free a 25% restocking fee will be deducted from the refund of the price of the piece. We strive to ship within 3 business days of the receipt of your order. Weekends and religious holy days may lengthen your shipment's time in house as may very busy times. We are extremely careful in our packing using bubble-wrap, peanuts and/or styrofoam inserts. In spite of all precautions sometimes breakage does occur. Please if this happens keep all of your wrappings and the piece. We insure most pieces in transit and we will be working with you to get you your money back from the shipper. The only exceptions to our insurance policy are porcelain beads and other items under 13oz and $20 in value. We ship through Etsy. Therefore, the US Postal Service is used. If a piece is small and light enough it may be shipped by USPS first class in which case it may go in only a padded envelope. Otherwise shipment is ground parcel post or Priority Mail, whichever is least expensive. Please note that buyers are responsible for any and all duties and customs charges that may be incurred. We cannot be responsible for shipping problems past the borders of the United States. All international shipping is at your own risk. Buttons and beads may be hand-washed without difficulty. But they are not recommended for the washer or dryer since being flung up against the sides of the washer or dryer may break the porcelain. Please feel free to message me through Etsy to ask for a different listing of quantities or sizes or just to ask a question. Currently all listings in the Handmade Bead and Button section are for sale using the following chart. The other sections are not available for quantity discounts yet. Please contact me about individual pieces that you are interested in buying at wholesale. I am currently reworking my price structure to accommodate wholesaling and every piece that can be sold as a multiple has not been repriced as yet. * A single item or listing for sale may be made up of a group of pieces such as a set of dishes or a set of buttons. ^All items are typed by section. By ordering 5 or more listings from the bead section for example you will receive a discount if you contact me for a reserved listing. Please communicate with me about your order so that I may list a RESERVED order in your name for you. Your discount will be figured into its shopping cart price that way.